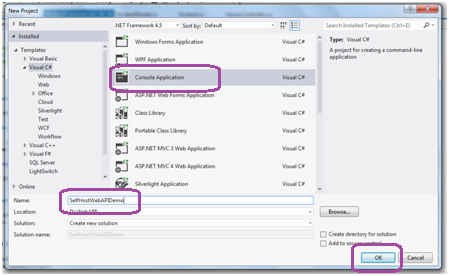 In this article we will see how to how to Self Host a Web API Application. 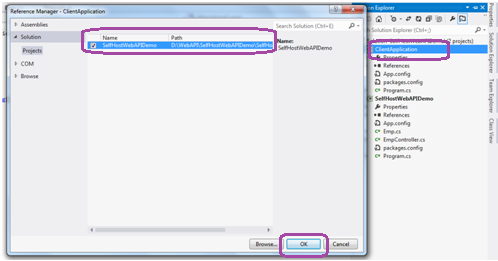 We can host a WEB API in IIS/Windows applications or even a console based application. In this article we will self host the Web API application in its own host process in a console based application. 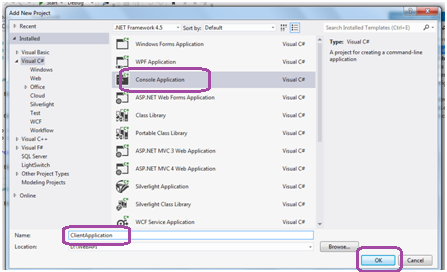 In this article we will see how to how to Self Host a Web API Application. We can host a WEB API in IIS/Windows applications or even a console based application. 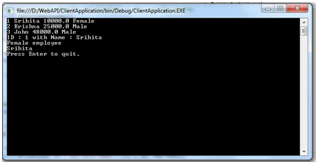 In this article we will self host the Web API application in its own host process. 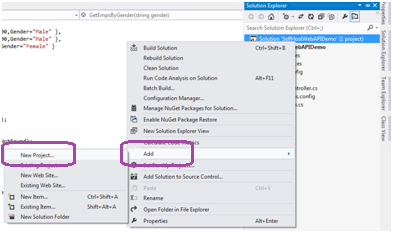 Launch Visual Studio 2012 -> File -> New -> Project -> On the Left Side of open dialog box Select Installed ->Templates -> Visual C# -> Console Application-> Name : "SelfHostWebAPIDemo". 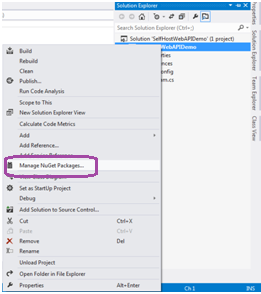 Since ours is a console application, We need to add Web API assemblies using NuGet Package Manager. 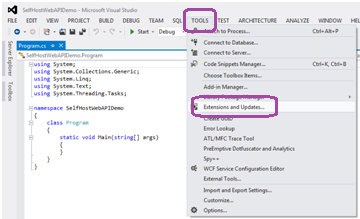 If you are new to creating Web API, First you need to download and install it using below process. Go To Tools -> Extenstions and Updates -> Select Online on Left hand side -> type "nuget" in the search box -> Select the NuGet Package Manager -> click Download -> Install. This install Nuget Package Manager. Right click the project in solution explorer -> click Manage Nuget Packages -> In the Manage NuGet Packages window -> in the search box type self host -> This lists the self host packages -> select ASP.NET Web API Self Host -> click on Install -> Accept the License Agreement -> Click on close. GetAllEmps: returns all the Employee details. GetEmpById: returns a specific Employee with an id passed as parameter to this class. GetEmpsByGender: Returns list of Employees with matching Gender same as the parameter passed to this method. 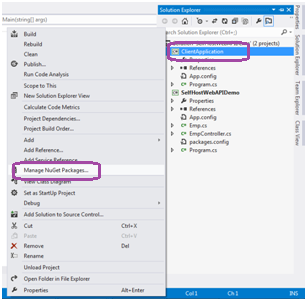 Step 8:Now we need to add "ASP.NET Web API Client Libraries" to the client project using NuGet Package Manager. Select the SelfHostWebAPIDemo project -> Click OK.
//Gets all the employee details and displays on the console window. //Gets employee details with a specific employee id and displays on the console window. //Gets employees with gender matching the parameter value and displays on the console window. Please make sure you run Visual Studio as an administrator. I am developing application with WEB Api with contains Nuget Packages can you please explain how can i host this application into IIS. Sorry for late response Umesh. 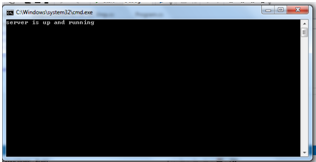 Once you develop your web application host it in IIS this in turn will host Web API in IIS.